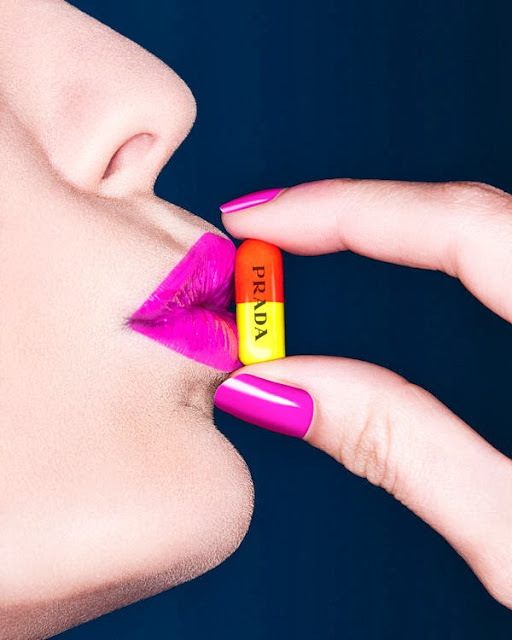 The Steve Kraitt “Designer Drugs” beauty story comments on society's obsession with brand names. A strong association with luxury and status makes labels like Yves Saint Laurent, Chanel and Prada a dream for many who long to acquire their beautiful and pristine products.In this case, the products in question are lip color cosmetics that are showcased in a palette of dynamic hues ranging from classic crimsons to the outrageous blues. Model Echo Nittolitto poses in the fashion fiend image series that features bold beauty looks courtesy of makeup artist Michelle Court.From Yves Saint Laurent's electric blue lips to Gucci's purple pucker, the Steve Kraitt "Designer Drugs" beauty story highlights perfect lips and pill props that boast the logos of some of fashion's most coveted labels.